By supporting this website, these FUNraisers are supporting parents, children, our community, and YOU! And you can become a FUNraiser too! K-House Karaoke offers private rooms for karaoke parties. Kids will be singing along to their favorite tunes, with microphones, crazy lighting, goofy costumes in their own comfy, cool room. A great place to celebrate a birthday, or just to get together with some friends. P.S. Parents will love K-House too. 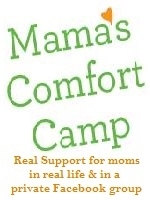 Mama's Comfort Camp is a "refueling station" for moms of kids of any age. They use a Facebook group where hundreds of mothers from around the world get to share their ups and downs and support each other deeply in a judgement-free safe space: what the members post can only be seen inside the group, not anywhere else on Facebook. Mama's Comfort Camp is the brainchild of Yael Saar, a local Ithaca mama, so it has close to two hundred members from the Ithaca/ Tompkins County area. This gives women the opportunity to ask for support online but get it in real life, from a vibrant community of amazing local moms. Locally Mama's Comfort Camp hosts a monthly support meeting for moms on the first Thursday of the month at 12:30pm in Downtown Ithaca, as well as various play-dates, mama's nights out, classes and outings.